7 Sultans Casino is part of the Fortune Lounge Group of Online Casinos. Of the Fortune Lounge Group, it holds the distinction of being the longest-running online casino. As with other Fortune Lounge casinos, 7 Sultans Casino is known for its loyalty to each player, its good support and service offered, and is also known to be a secure online casino. 7 Sultans online casino is licensed in Malta by the Lotteries and Gaming Authority of Malta. The online casino holds the eCOGRA Safe and Fair seal. The online casino is independently audited and reviewed on a monthly basis. Banking is offered in multiple currencies and players may choose to play in a number of different. US players are not able to play in this online casino. Security: The online casino uses an advanced fraud management system, Risk Sentinel, in order to protect its players. The online casino has 128-bit SSL Digital Encryption to protect players when making online financial transactions and when providing personal information. $/€500 free in tailor-made 100% Match Bonuses! Here’s a great way to become acquainted with the fantastic Microgaming games at 7 Sultans online casino. If you haven’t yet opened an account at this site, head to the platform and register a real money account. This will make you eligible for the generous New Player Welcome Bonus of $/€500 free, which can be claimed in up to five 100% deposit matches. • You have $/€500 free in 100% deposit matches to make use of over a maximum of 5 deposits. • Claim all $/€500 on your first deposit or split it over multiple deposits. • The choice is yours how you’d like to split it. Win 1 of 3 Las Vegas Double Prize Packages! The Fortune Lounge Group is giving away three Las Vegas double prize packages to lucky players. All you need to do is play your favorite Microgaming games at 7 Sultans Casino, and you will earn reward points. For every 100 reward points you earn, you will earn entry into the Las Vegas draw. In addition, each time you fill up the arrow and reach 100%, you will get the chance to scratch for an instant prize! 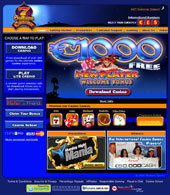 The Loyalty Rewards program is offered to all players from the time that they sign up with the online casino. Players begin in the Silver Level, and can continue up in the ranks through the Gold, Platinum, and Diamond levels. Players need to maintain their Loyalty Rewards level on a monthly basis. Loyalty points are awarded whether a player wins or loses. 7 Sultans online casino is licensed by Microgaming online casino software. Players may play in many different languages, including English, French, Spanish, German, Italian, and Portuguese. Players can enjoy nearly 500 online casino games including a large range of slots and video poker, and the classic table games such as blackjack, craps, roulette, and baccarat. There are also a number of progressive jackpots available at 7 Sultans online casino. There are many options available for safe and secure banking at 7 Sultans Casino. Players may make deposits and withdrawals in various currencies such as €, £, AUD, CAD, and US$. Eco Card, Credit/Debit Cards (Visa, Mastercard and Diners Club), Click2Pay, EntroPay, ClickandBuy, Ukash, EZI Pay, eCheck, INSTADEBIT, Solo and Switch Debit Card, UseMyBank, Direct Bank Transfer, Moneybookers, NETeller, UseMyWallet. EcoCard, Click2Pay, EntroPay, EZIPay, Check, Bank Wire / Swift, Solo / Maestro Debit Card, VISA Credit/Debit Cards, Neteller, Moneybookers, InstaDebit, UseMyWallet. Players can make use of the English-speaking 24 hours a day, 7 days a week customer services department when they have any questions. Customer Support can be reached by live chat, email, Skype and via the telephone. Customer Support in French, German, Spanish, Italian, Greek, Portuguese, and Dutch are available at specific times, usually within office hours and some weekend hours. These times are listed on the online casino website.